Oyster Bay Resorts is a place where people can relax, enjoy privacy, and romance. Further enhancing the romantic theme is the unique shape of the chalets – resembling half hearts. 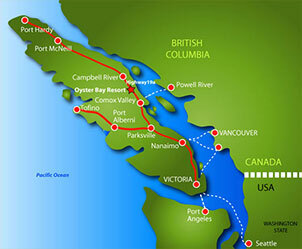 Our 20-chalet resort is located between Campbell River and Comox. A Banquet Hall is available for conferences, seminars, weddings and family reunions. Our commitment to our guests is to make their stay a truly memorable experience. You will begin to relax as soon as you enter the chalet with its gas fireplace and knotty-pine interior. Sit down on your private deck and enjoy the view of the Georgia Strait. Each 512 square foot chalet consists of a living space with an L-shape couch (formed by 2 single beds), TV, gas fireplace, full kitchen facility, with gas BBQ on a private deck, private master bedroom with queen size bed and duvet cover (we conveniently place an opening in the wall facing the bed so you can enjoy the magnificent ocean view). The large bathroom is equipped with a separate shower and a 2-person, 70-jets hydro spa tub. The chalets are perfect for 2 people, although they will also comfortably accommodate 4. We offer 20 non-smoking chalets,. One unit is also wheelchair accessible with whirlpool tub and handicap shower.